The barbell step up is great compound movement for the lower body muscles. It works mainly the glutes and the hamstrings muscles but almost every other muscle in the body is working to ensure the correct posture of the body and stable position of the bar. Therefore the barbell step up is an exercise which use a lot of energy and is a great choice in fat burning programs. Also is a great choice for the ladies who want to put some muscles in the glutes and to tight the whole hip zone. If you perform the exercise for bodybuilding purposes avoid alternating your legs each rep. This manner of performing reduces the tension on the muscles. If you want to burn fat and work on your cardio-vascular system and you have good balance be free to alternate. 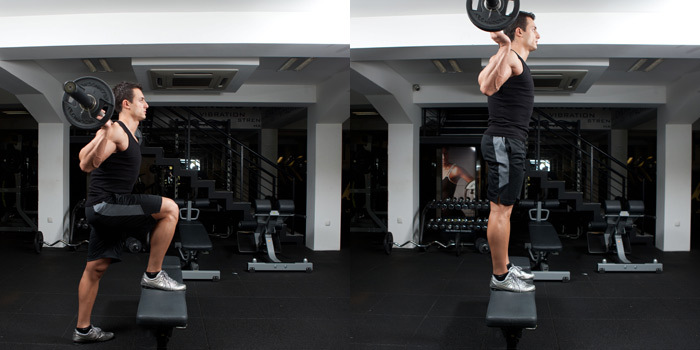 Stand upright in front of a flat bench with a barbell placed at the back of your shoulders (right under the neck). Lift your right foot and place it on the bench so that your heel is firmly to the bench. Adjust your position to the bench so that your thigh and lower leg form a 90-degree angle in the knee joint. Look forward straighten your back and flex your core muscles. This is the starting position. Inhale and start to lift your body up by pushing mainly with the heel of your right leg. When your right leg is almost full extended step on the bench with your left foot. Exhale during the upward movement. Step back with your left foot and return yourself slowly back to the starting position as control the movement. Perform the desired amount of reps with your right foot then change it with the left. Perform the exercise first with your weaker leg. Avoid pushing yourself upward with the lower leg. The main force should come from the heel of the upper leg. Keep a 90-degree angle between your lower and upper leg to avoid knees problems. Keep a good posture during the exercise – straight back, chest up, flexed core (abs and lower back) and head forward. Perform the negative part (the way down) for twice longer time than the positive (the way up). Use dumbbells if you have balance problems or you are a beginner.